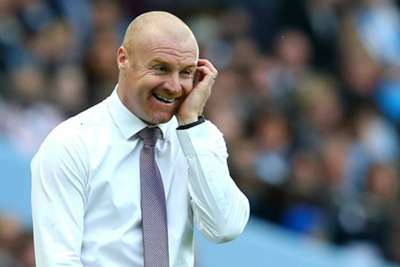 A hugely frustrated Sean Dyche felt two Manchester City players should have been sent off and accused the Premier League champions of cheating as his Burnley team were battered 5-0 at the Etihad Stadium. Goals from Sergio Aguero, Bernardo Silva, Fernandinho, Riyad Mahrez and Leroy Sane saw Pep Guardiola's side ease to victory on Saturday. Yet City's second goal, scored in the 54th minute, was controversially given as the ball appeared to go out of play after Burnley's defence paused in anticipation of a call from referee Jon Moss following a challenge on Sane. Dyche highlighted that incident as a key moment and was also unhappy with Moss' decision to only book Vincent Kompany for a high tackle on Aaron Lennon in the opening minute. "I don't like red cards if they can be not given... but that one's a red card because he [Kompany] is out of control, he doesn't know where the man is, he doesn't know where the ball is," Dyche said at a news conference. "It's just a throw of the leg and it's high, Az [Lennon] has got a cut with two stitches in it, high on his thigh. "There's no control in the moment, [it's] not vicious or anything, but there's just no control in the challenge and we're told that control is a big thing in those type of challenges so it's a red card." Dyche accepted his team should have kept their concentration as City scored the decisive second but felt there were numerous reasons not to give the goal and also claimed Sane should have been dismissed for clashing with Matt Lowton. "There's so many different things. Sane goes down with the tiniest of a touch, a pull of the shirt," he added. "I don't know how hard you need to pull a shirt for someone to spin around and fall on the floor; as you know, I'm always amazed by what's going on in the game at the moment. "So then our players are responding to that feeling aggrieved that he's gone down far too easily, let's just say, we'll leave it at that. Then the referee is going to blow his whistle, then he decides not to blow his whistle and waves it away. "In the meantime a player [David Silva] who's off the pitch now has walked back on the pitch to go and get the ball that's off the pitch, to deliver a cross that they then score from. If that's not confusing for everyone in the stadium it was certainly confusing for me. "I thought it then, I've seen it back. With the best view we can get of it the ball was out of play - forget about everything else. The biggest learning curve, I was saying to the players afterwards, you have to stay focused and then afterwards remonstrate. "The problem was we were that locked in that moment we didn't let it go and then they scored from a really soft corner and the game's gone then. We're not getting back here at 3-0." Dyche continued: "Then we get onto the Sane one, it's got to be a red card for kicking Matt Lowton for no reason at all, just smashing around his legs, got to be a red card, simple as that. "That one is a definite, I don't think there's any debate in that because you can't just run around a football pitch and when the ball is miles away from you just absolutely smash someone round the legs. That's unacceptable, surely, in everyone's view. So I think that one's a given. "But it's just crazy now where the game's at. No one cares about diving, people are diving all over the place, they [City] did it again today and yet no one cares about it. "I'm amazed by what's going on in the game but no one cares about it."